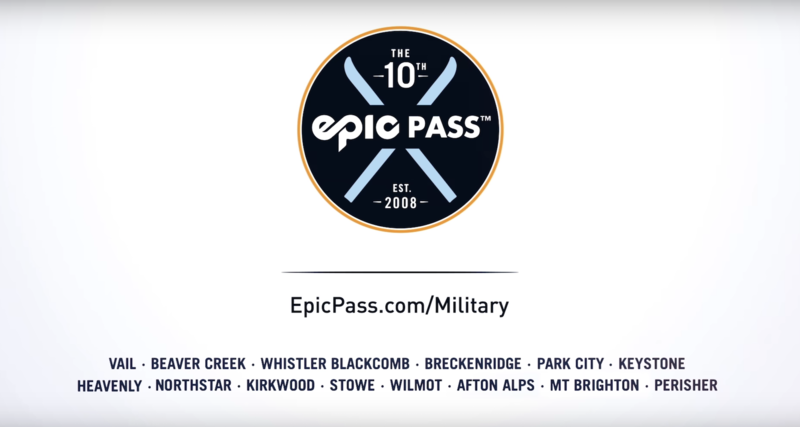 In celebration of the 10th Anniversary of the Epic Pass, Vail Resorts is honoring the service of the Company's founders from the 10th Mountain Division, and men and women of the U.S. Armed Forces, Canadian Armed Forces and Australian Defence Force, with the introduction of a $99 Military Epic Pass for active and retired military and their dependents, available beginning on Tuesday, March 6th. Additionally, for every 2018-19 Vail Resorts Season Pass sold, the company will donate $1 to the Wounded Warrior Project (WWP), a nonprofit organization that offers a variety of programs, services, and events for wounded veterans of the military. Based on 2017-18 pass sales, the donation would exceed $750,000. "Vail Resorts’ pioneering spirit and our core value of serving others can be traced back to our founders, including Pete Seibert, who served in the U.S. Army's famed 10th Mountain Division during World War II, and Earl Eaton, who served as an army engineer during the war," said Rob Katz, Chief Executive Officer of Vail Resorts. The Military Epic Pass for all U.S., Canadian, and Australian active and retired military personnel and their dependents will be priced at $99, an almost 90% discount off the regular price of the Epic Pass. The Military Epic Pass for all other U.S., Canadian, and Australian veterans and their dependents will be priced at $499 for adults ($269 for a child pass), a more than 40% discount off the regular price of the Epic Pass. The existing Liberty Pass will be expanded to include all U.S. veterans and their dependents and to eliminate any restrictions. Priced at $269 for adults and $199 for children (ages 5-12), the Liberty Pass provides unlimited access to Keystone and Arapahoe Basin with no blackout dates. Vail Resorts will donate $1 for each 2018-19 season pass sold to the Wounded Warrior Project. Based on last year’s pass sales, the donation would exceed $750,000. Vail Resorts' Chief Executive Officer Rob Katz will personally donate $750,000 to Operation Homefront.